While there exists an ongoing debate as to the importance of lore within writing as a medium for an author's expression of the context of a story, on TNRPG (as a cooperative and competitive storytelling medium), the established lore is of paramount importance. The nature of the world used to tell stories is one of dynamic interaction between player characters, who shape the course of the history of that world. Even after a character's exploits have faded into history, the flux of characters that have interacted with them, whose motivations may very well be shaped by those faded characters, will in their own turn shape the course of history. The cyclical influence of characters over one another is a core narrative tool of TNRPG, and it is for that reason that accurate summaries of past events are kept. This topic will remain relatively up-to-date with village records and current events. The outline of each village will be broken up into two sections: History and Recent Events. The History section will provide background information on the village, covering the last hundred years. The Recent Events section will outline the most recent events as they occur within the world in-character, with those events eventually fading into the History section as the years pass by. Finally, outlines of the Monk, Samurai, and Imperial Origins will be listed on their own pages, to allow players to better understand the flavor of each Origin, and to better-illustrate the role that characters of each Origin play within a world dominated by shinobi. The date system used is "After the Sage" (AS), referring to the point of time at which the Sage of Six Paths taught shinobi how to use chakra. 300 AS : Canon events occur. 700 AS : Start of this site. 702 AS : Sunagakure is destroyed by a bijū attack. 703 AS : The Kage Summit is held in the Land of Iron during which the Shogunate is destroyed. 704 AS : The Chūnin Exams are held in Otogakure and Sunagakure is destroyed again after initial reconstruction had begun. 705 AS : Iwagakure surrenders autonomy to Otogakure. 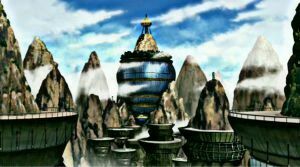 706 AS : The Chūnin Exams are held in Konohagakure. 707 AS : The Guild of Guilds establishes relations with the shinobi villages; the Republic of Wuatyrfael is founded on the ruins of Takigakure. 708 AS : Kirigakure is destroyed by a cataclysmic meteor, a byproduct of the battle between Shinji and Donar; the eastern shores of the continent are devastated by earthquakes and tsunamis, and a great crater known as Donar's Landing is the only remnant of Kirigakure. 709 AS : The Chūnin Exams are hosted by The Republic of Wuatyrfael. 710 AS : The Republic of Wuatyrfael assaults Otogakure, lead by Consul Heinrich von Stauffen and his commander, Akakios; the Consul Heinrich is slain in the battle, marking a period of political turmoil in The Republic, as well as uncertain relations between the Republic and all shinobi. 711 AS: A Kage Summit is held in Kumogakure, corresponding with the village's hosting of the Chūnin Exams. 712 AS: The village of Sunagakure reemerges into the world, a small town of survivors and shinobi seeking to rebuild for a second time. 813 AS: Kana, the reincarnation of Kang, is claimed from a mysterious island by Konohagakure. 815 AS: The Eighth Great Shinobi War begins, with Kemurigakure destroyed at its onset. The Eighth Great Shinobi War is underway, and after a brief lull in the action, tensions are beginning to rise once more! Of all the major villages, Konohagakure had for the longest time been the shining star of the ninja world. Under the Hokage, Lord Keiri Okami, the village had a long period of prosperity, which had, until that point, guaranteed its continuing success as the most powerful of all nations. It was not until the rise of one of his kinsmen, Shinji Uchiha, that this “natural order” had come to be threatened. Shinji broke away from Konoha in the early years of the 8th Century A.S., and took many of his Uchiha brethren with him, after dealing Keiri’s successor a humiliating defeat in combat. This marked the beginning of Konoha’s decline as the ninja world’s foremost power. Eventually, the village came to be ruled by Lady Akane Uzumaki, the twenty-third Hokage. This began the development of a rapid shift in Konoha’s foreign policy, marked with an alliance with Otogakure and its new leader, Lord Shinji Uchiha. Many consider this to have further weakened Konohagakure, as they began to rely on their alliance with Otogakure to solve many of their problems, including having Konohagakure nin perform Otogakure’s missions as part of their treaty, further diverting their military strength. Many Konoha-nin found Otogakure’s contracts more lucrative than those of their own village, leading to a further weakening of their military strength. After Lady Akane’s disappearance, she was succeeded by Lord Akio Sarutobi as the twenty-fourth Hokage. Konohagakure’s deterioration was curbed during this time, as Shinji Uchiha eventually departed the continent, leaving Otogakure in the hands of Lord Tatsuya Kesshoukei. Given that Lord Tatsuya and Lord Akio were roughly equivalent in strength, it lent a sense of parity to the two villages that lasted throughout their lives. Together, these two powerful men waged war on Kumogakure, and ended up in joint control of the village for several decades. After the two kage passed away, the power dynamic between the villages began to shift. Konohagakure continued to produce competent shinobi, while Otokagure began to struggle. As Otogakure began to slip and decline, many Konohagakure shinobi returned to performing missions for their own village, which further weakened Otogakure, which had begun to rely on Konohagakure shinobi to fulfill their mission contracts. Given Otogakure’s weakened state, the alliance between the two villages was finally broken in 784 A.S., when Otogakure was too weak to honor its commitments in putting down the rebelling Kumogakure shinobi. Konohagakure spent several years preparing for war, as a particularly harsh winter made supply travel impossible, and internal political struggles slowed the process, as Konohagakure Uchiha desired to attack Otogakure to reunite the Uchiha clan, rather than target Kumogakure. After several years of preparation, having quelled the internal unrest, Konohagakure marched to war with Kumogakure in 791 A.S. The two villages remained locked in a war for nearly ten years, with Kumogakure fighting a guerrilla war that eventually wore away at the aggressor’s resources. After ten years of war, Konohagakure withdrew from Kumogakure in 800 A.S., and returned to its own devices. During this time, while Konohagakure was embroiled in conflict with Kumogakure, Otogakure added insult to injury. In 797 A.S., Otogakure marched to conquer the Land of Rain, but in order to reach the Land of Rain, it had to march through the northern portion of the Land of Fire. While Konohagakure was preoccupied, Otogakure marched through Northern Shumatsu, seizing the land as it went, and using the strip of land to connect Otogakure and Amegakure. This was a a humiliation for the Land of Fire, which was unable to fend off the Otogakure forces, and unable to call their hidden village into a second consecutive war. To this day, it still harbors ill-intent towards Kumogakure, and mistrust towards Otogakure over their broken alliance and their sudden seizure of territories in the Land of Fire, compounded with unrest between the two factions of the Uchiha. Konohagakure now stands on the edge of a knife, either able to return to their former glory, as seen under Lord Akio, or to plummet into misery, like their former ally. Under the direction of the Hokage Kanari, the village of Konoha has marched to war against Kemurigakure. Allied with Sunagakure, they are opposed by Kemuri's makeshift allies of Kirigakure and Kumogakure. Not all goes as planned, however, as Konohagakure's ANBU, the Fox, has defected, and destroyed the Intelligence Headquarters on her way out. Kirigakure was one village that did not see the best developments over a century ago. For awhile, they were one of the great villages in the land, boasting a military and economy as impressive as the likes of Konohagakure and Otogakure. However, this was not meant to last. A series of events led to a rapid series of changes in the Mizukage position, starting with the death of Lady Ayame Kasume by the hands of the Raikage, Kira Takoyaiba, who also declared war against the Mist. Chosen to succeed her was the young Masaki Tajiri, who vanished by the first night of his leadership in a secret, fateful battle over the future of the village with his comrade, Kajiya Jintei. Believing he had killed Masaki, Kajiya later took on the mantle of Mizukage. Though the Raikage's war never truly came, the worst was yet to come. Unrelated to the village, Donna Aesir and Shinji Uchiha later fought in a true battle of gods across the shinobi world, their otherworldly abilities bringing them from one locale to another - first they fought in the highest mountains of the Land of Lightning, then the dunes of the Land of Wind. In that battle, the Uchiha lord unleashed a devastating attack: a Chibaku Tensei unlike any the world had experienced before. In that moment, Donna made a terrible decision; he transported the massive gravitational force over one of the many islands surrounding Kirigakure. This sudden appearance rocked the Land of Water for the first. Chunks of land and water ascended to the sky, gathering around this gravitational force before it too ascended to become what we now know as the Second Moon. The landmasses were torn asunder, and the tides reacted violently to the sudden shift. Massive tsunamis rose from the ocean to crash down upon all of the surrounding land, including Kirigakure, whose hurricane and tidal walls provided little protection against this caliber of storm. Today, historians still wonder if perhaps there was anything more that could be done, but as history played out, nothing was. Lord Kajiya had been otherwise incapacitated for reasons unknown, and the village of shinobi could not combat this natural catastrophe -- Kirigakure was destroyed in the crossfire. That was in 708 A.S. The land spent several years completely devastated. The people slowly worked to make the land habitable again. First, they reestablished crops and doubled up on the less-damaged lands. With each passing month, as the tides began to drop more and more, they moved back towards the mainland to reestablish civilization. It was two or three years before a mysterious organization named Outer Heaven, led by the rebellious ex-Raikage Kira Takoyaiba, founded the rebirth of the village. This action led as a rallying cry to many of the Kirigakure refugees throughout the continent, recalling them back to the village to serve once more. The village was renamed to "Kiritensei" - Kirigakure reborn. Kiritensei, to Kira, was a base from which to operate in the shadows and conduct his own organization's schemes. While he is attributed the legacy of being the one to resurrect the Village Hidden in the Mist, it was not him, but one of the coming Mizukage who truly brought the village back from disaster. In 712, Lady Makita Lyunn, a Kirigakure native who possessed the Three-Tailed Beast within her, returned to carry the mantle of Mizukage. This was met with thunderous applause, as the man before her, Saigon Baek, was not truly a native to the lands. Having one of their own reaffirmed a sense of nationalism, giving Kirigakure a great boost to morale. Kiritensei faced many crises in the coming years-- mysterious bombings by rogue ninja tested the young Mizukage. In 714, Lady Makita launched a secret operation to expose Outer Heaven from behind the curtains of her village, bringing them out into the daylight and chasing them out of the village. After that, Kiritensei was finally its own again, and renamed to how it once was: Kirigakure. Lady Makita used this opportunity to look inward toward a full recuperation from the plagues that had troubled her village in the last decade. She was a kind Kage who desired nothing more than peace and prosperity. She adopted a sort of isolationist policy, keeping her village out of world disputes such as the coming war between Kumogakure and Konohagakure/Otogakure. These policies allowed Kirigakure to remain safe for years. Kirigakure engaged in very minor disputes occasionally, mostly small disputes championed by rogue ninja or those from other villages acting without permission. The lesser powers on the continent feared striking Kirigakure for fear of Lady Makita's strength, and many of the stronger villages did not hold bad relations with Kirigakure, credited to Makita's charming personality. To her people, she was the hero they needed most at the most crucial time that led to a period of prosperity. This situation held for a long time and spread into Lady Makita's successors. Those policies of isolationism remained as the village continued to focus internally. This lasted until around 794 A.S. Kirigakure stood as one of the great villages in the continent, and political sides in Kirigakure had begun to differentiate in ideology from the last century. Internal political tension was on the rise, with many of the elders and prominent voices in the village speaking out to return to a more militarized state that made use of its available power. This was, for the most part, unsuccessful -- the mantle of Mizukage remained in the hands of those who followed their predecessors in their strive for peace. Despite the rebelling opinions, Kirigakure was able to keep a grip over its policies. Several situations arose in the past few years from these war-mongering souls attempting to start a situation that the Mizukage couldn't solve diplomatically. These were things such as pushing the boundaries of the Land of Water and the Land of Fire's fishing territories, raiding the Land of Lightning's mines, and a couple of more. Each situation, fortunately, did not amount to a large war or held grudges. It was only recent, in late 812 A.S. that political, internal strife has taken an entirely new twist: Lord Benjiro Hiriyama, the until-recent Mizukage, was assassinated. The possibility of an outside assassination attempt was quickly ruled out, leading the village to discover that this was an act of defiance by a secret faction of those shinobi in the village seeking to discard the isolationist policies and see a militaristic Mizukage. In light of this, the village has been in turmoil; with the election of a new Mizukage, the village is deeply focused on solving these internal problems, ousting the internal disputes that threaten solidarity of their nation. Many have asked: is it time to rejoin the world theater, or continue their isolationism? After having one of their high-ranking shinobi assassinated, Kirigakure has been on guard. Recently, they have sent a force of shinobi, bolstered by various members of the Seven Swordsmen, to aid Kemurigakure against Konohagakure. Sunagakure's history is long, violent, and mostly lost to time. The records of the village in the early 8th century A.S. are now kept almost exclusively by other villages, as the Village Hidden in the Sand has been reduced to dust more than once. In the year 704, after the village had been levelled for the second time in fewer than five years, it seemed as though its inhabitants had finally given up attempting to reconstruct the power hub of the Land of Wind, with the country receding into obscurity for the next decade. The country didn't return to the geopolitical stage until a particularly dedicated pair of shinobi, Mendou Chikamatsu and his wife Hisako, led the few shinobi that remained to the Land of Wind to reconstruct the hidden village. The village had, after its repeated destruction very few resources with which to construct buildings anew, so the founding population had to make do with little more than rubble. Eventually though, the riches that the village once possessed began to return. The practically endless glass supplied by the Glass Plateau to the north of the village brought skilled glaziers from across the world to the growing village which, along with silks and spices from the far oases of the country eventually ushered in the return of the village to the global theatre. As Kazekage, Mendou governed well and actively, though after he had gathered fifty years under his belt without an outward change in appearance, suspicious had long since been raised as to his person. His general good nature was the only trait of his that saw him through to the time of his wife's death, at which point he resigned from his leadership of the village. The 29th Kazekage was last seen walking into the desert in the dead of night, away from the village and into the sands. The fifty years of prosperity that Mendou had overseen were not totally insular years for the Land of Wind, but after the first five-odd years of his rule, the Kazekage took a much less active stance on world politics. Receding into the background of the political climate of the time was easy in the mid-8th centuty A.S., as conflict and war blustered to the continent's far Northeast. In this state of political stability, the many clans that had once fled the village and country to seek refuge in neighboring lands gradually returned to their ancestral home, though both it and they remained forever changed by the experience. The modern descendants of these returned clans are but the second (on rare occasion, third) generation of their family to the village, and as such remain decently short of numbers that they would have had prior to the village's repeated destruction. Within the last thirty years, the village has once again shifted towards having an active hand in the goings-on of the world. After Mendou's resignation, his great-nephew, Matsuhiro, took his place as Kazekage. Born in Sunagakure and groomed for command, he was the perfect candidate for delivering new direction to the village. Under Matsuhiro's management, the village took part in funding conflict between Konohagakure and Kumogakure. Matsuhiro had likewise positioned the village much more aggressively on matters of state security, bolstering defenses, and returning bloodlines that had once exclusively been resident in the Land of Wind to their proper home. In these pursuits, the Kazekage managed to overextend, exposing himself and his agenda in a moment of weakness. Many in the village were witness to his assassination at the hands of a now-nameless, faceless shinobi, whose name has since been erased from all records by Matsuhiro's successor. Though the assassin's motives were not entirely clear, speculation has laid out motives as arcane as a secret cabal connected to the assassination of the former Mizukage and as simple as heat of the moment. Between the turmoil caused by the assassination and the encroachment of Land of Earth shinobi on the country's northern borders, the first year of the new Kazekage's reign have been some of the most stressful in a century. Under the leadership of the Kazekage, Chikamatsu Kyousuke, war has been declared on Kemurigakure. As well, the Blue Tiger of the Sand, Mangetsu Shingen, was killed by Konoha's Fox-masked ANBU. For many years into the early 700s A.S., Kumogakure was plagued by inefficient governments. Each following Raikage was unable to hold the village together for long, either through inability, untimely demise, or betrayal. These years were filled with questionable missions that generated friction between the Village Hidden in the Clouds and their neighboring countries. Lord Kira Takoyaiba became absent for extended periods of time, and conducted raids and thievery missions on nations such as the Land of Fire and Land of Rice Fields. Lord Kitsune Takoyaiba took the lead after that, dealing with the revolt of his predecessor turning rogue. Although his reign looked promising, he met an untimely death all too early. Lord Seigi Douchiwa would come into power following that. His title was quickly revoked after staging a massacre of the Takoyaiba clan that backfired on his own. In a period of political backstabbing and distrust, Lady Kazue Kurome took the mantle. By then, Kumogakure had already marked itself dangerous to many of the other countries. In the year 714 A.S., in an attempt to regain control over the government and secure connections that the new Raikage could trust, Lady Kazue staged an operation to install one of her students Asami Raihana as the new Lightning Daimyo. While the operation was a success, Nobuyuki Ishida(the previous Lightning Daimyo) escaped. The situation spread to the neighboring lands, and his crisis reached the ears of the Rice Daimyo, who urged Otogakure to assist in resolving this corruption. As a village with numerous skirmishes in the past with Kumogakure, Otogakure accepted. Lady Kazue led an army to meet Otogakure's own Kage, Tatsuya Kesshoukei, in battle on the rolling hills of Takagamahara. With no sign of a peaceful resolution looming overhead, the Raikage's forces engaged in combat. Unfortunately, the generation of Kumogakure shinobi had yielded very few individuals of exceptional talent. In a short battle, Lady Kazue lost her life. Highly demoralized, Kumogakure's forces retreated to the village. In their panic, Lady Asami returned to the village, armed and ready for combat. A reinvigorating speech inspired the troops to stand for all Kumogakure held dear. However ... Nothing could have prepared them for the ambush from Konohagakure. Lord Akio Sarutobi of Konohagakure, Otogakure's ally and another nation peeved by Kumogakure's recent shady history, had staged a surprise attack on Kumogakure soil. Caught off-guard, the village tried their best to hold off their attackers. Asami, Terra Origami, and Riku Oomori, any many others tried their best, but the result was inevitable. Many brave shinobi lost their lives before Kumogakure waved the white flag. Kumogakure had lost. The coming months did not see everything lost-- though defeated, Kumogakure was allowed to remain active as a sub-village, their resources split between repaying war costs to the Land of Fire and the Land of Rice Fields. With their greatest warriors dead, defeated, or scattered across the land coping with losses, Kumogakure fell out of prominent power. They were left in this weakened state for many decades. Slowly, they were rebuilding. It was not until 784 A.S. that their strength had returned to a point that could match the other nations. It was their time to make a stand. Led by a new generation of proud, strong shinobi, Kumogakure challenged its suzerains. While Kumogakure had been growing its strength, generation after generation, Otogakure had found itself in decline. It was unable to exercise control over the discontent village, leaving just Konohagakure to try to enforce its will on Kumogakure. The two engaged in open warfare, beginning in 791 A.S. The war lasted for a decade, with Kumogakure frequently engaging in guerrilla warfare, striking at Konohagakure’s forces and supply lines before disappearing back into the mountains. After nearly ten years of prolonged struggle, Konohagakure withdrew the last of its forces from Kumogakure in 800 A.S., marking the beginning of a new century with a new political landscape. Under the leadership of the Raikage Shizuka, Kumogakure's bijuu, the Hachibi, has found a new host in the samurai Haruko. The history of Iwagakure, comparatively to other villages, is rather short. That is because for the majority of recent history, Iwagakure was disbanded. This came around from the decision of one Tsuchikage: Rusuban M. Shijimi. Upon meeting with the Otokage at the time, Shinji Uchiha, Rusuban came to regard Shinji as a God after being awed by his terrifying abilities. As an offering to the perceived deity, Rusuban offered the village of Iwagakure to Shinji in 705 A.S.. Thus, Iwagakure became property of Otogakure. This did not last long, for the Uchiha lord had different plans. Desiring a demilitarized nation, the Otokage disbanded Iwagakure's military, bringing the Land of Earth under Otogakure's direct protection. This action was immediately met by resistance from many of Iwagakure's top shinobi, most notably from two of the village's legendary Sannin: Donar Aesir and Skia Kunihisha. While unable to make a stand immediately, the two gathered strength and allies in an attempt to stand up to Shinji for unification of their village: The first battle led to Donar's death. Following his friend's late dreams, Skia engaged a second battle that would come to be his end as well. From there on, the village was able to run free for a long time. The battle against Donar and Skia in 708 A.S. marked the last major stand. In the coming decades, there were periodic spouts of attempted revolts-- people wanting to bring back militaristic infrastructure and hoping to establish a sort of nationalistic pride to rebel against Otogakure. None of which saw much success, the people of Iwagakure and the Land of Earth as a whole for the most part enjoying the luxury granted to them by Otogakure occupation. Their protector's strength was widely acknowledged enough to keep them safe. Economy and education boomed. For many decades, Iwagakure remained in this state. Times changed eventually. Entering the later half of the century, Otogakure's power and status within the shinobi world had begun to diminish, leading the people of Iwagakure to grow wary of the protection that they were truly being afforded. This raised cause for concern, prompting city officials to begin petitioning for the reopening of Iwagakure as a shinobi village. This was shut down for several years, but in 789 A.S., Otogakure finally gave in, seeing their hold over the village more of a liability at that point. Thus, Iwagakure saw an independence it had not experienced for over 80 years. In the recent 25 years, Iwagakure has enjoyed the change in lifestyle, rebuilding their military to someday stand on their own two feet. The village has still not come close to its former glory a century ago, nor has it reached a parallel strength to the other great nations. Still, they're getting there. Iwagakure has taken care not to engage in political hostilities with any of the larger villages-- rather, most of their skirmishes have dealt with Kusagakure and Amegakure. The village has gotten more bold in the recent months; the current Tsuchikage has expanded the Iwa-nin forces down towards the Glass Plateau to increase mining operations, posing possible conflict with Sunagakure over the minerals in the area. For many years, Otogakure was on top of the world. Brought to prominence by their Second Otokage, Lord Shinji Uchiha (better known as the Second Coming of the Sage) created a village with a military might unrivaled for years. The man himself was revered as a God, and the shinobi of the village were no joke either. Even after his sudden disappearance, the village kept a strength that made every village fearful to engage it; most notable among Otogakure's great shinobi of the generation were two: The Third Otokage, Lord Tatsuya Kesshoukei, and Soujiro Uchiha, Shinji's successor as the leader of the Uchiha. Otogakure faced many hardships, emerging victorious and stronger than ever with each trial. In 710 AS they faced the catastrophic event later dubbed "Cotard's Delusion", a blood attack from the Imperials led by then-consul Heinrich Von Stauffen for control of the village. In the years that followed, Otogakure faced many political disputes with Kumogakure. Secret killings of Otogakure shinobi and surveillance for sabotage tainted their relationship. Although Lord Tatsuya and the various figures in Kumogakure's leadership tried to maintain peace, it eventually couldn't be held together. In the year 714, Raikage Kazue Kurome replaced the Lightning Daimyo Nobuyuki Ishida with one of her own students, Asami Raihana, in an attempt to gain more control and trusted advisers in the political scene. Lord Nobuyuki fled to the Land of Rice Fields and sought assistance from the Rice Daimyo, who contacted Otogakure with a request to engage and settle the crisis. Kumogakure's history of shady strategies and criminal activity only worsened their appearance when Lady Kazue went for political dominance. Fearing Kumogakure's leadership to be dangerous to his own people, Lord Tatsuya Kesshoukei reluctantly marched for war. His forces met Kumogakure's forces on the grassy hills of the Land of Lightning's Takagamahara. With no sign of peace in sight, Lord Tatsuya authorized his forces to engage, personally seeking out Kumogakure's Raikage to assume the burden of defeating their leadership. In hopes of ending the battle prematurely to spare a larger number of lives, when faced with Kazue's tenacity and stubbornness in backing down, Lord Tatsuya dealt a fatal blow to Kumogakure's Raikage. This worked as expected, robbing the Land of Lightning's army of its morale and causing a retreat. After a short rest, Otogakure's army marched towards the castle of the Lightning Daimyo to reclaim Nobuyuki's land. They were met with an unexpectedly small amount of resistance. This was attributed to a surprise attack launched by Lord Akio Sarutobi on Kumogakure itself, bringing their forces into submission before Otogakure hit the castle. Those two battles spelled Kumogakure's defeat. This brought Otogakure's citizens an easier feeling of safety, knowing the main enemy that threatened their peace had now been subjugated and reduced to a sub-state paying war reparations. This sparked a calm era for the village. Those who may have wanted to stand against the village thought twice after considering their power, and those villages who could challenge it did not choose to pick a fight. This golden period lasted for many decades until those shinobi famous from that generation passed away. The 770s A.S. saw the decline of Otogakure's military; while they were far from done, the central powerhouses that had kept the village strong for years were gone. With Tatsuya, Soujiro, Nami, and others all dead, Otogakure was not what it once was-- Konohagakure had long since broken away and declared its own independence (although they had kept friendly relations). Kumogakure remained in its debt until 784 A.S. Kumogakure's independence was a historical point that marked Otogakure's fall from one of the top villages. It was a great humiliation for Otogakure that they had lost their controlled interest in Kumogakure, especially given that they forfeited the position without a fight. This left Otogakure feeling quite antsy, and after the ascension of Lord Hayate Uchiha in 795 A.S., they began turning their sights to other conquests, so that they could assert their power. The village determined that Amegakure was ripe for conquest, and in 797, Lord Hayate led an army, marching through the northern edge of the Land of Fire, which he added to his domain, and swiftly conquered and occupied the Land of Rain. For many years, the Land of Rain had its independence guaranteed because all of the major nations had a vested interest in letting no one else control the strategic location. However, during the War for Kumogakure Independence, almost every nation was involved in fighting in the north-east, leaving the landlocked nation of the west vulnerable. With Sunagakure supporting Konoha, whom was fighting Kumogakure, and with Iwagakure pressing against Sunagakure's borders at the Glass Plateau, there was no one on the mainland to contest the invasion. Lord Hayate occupied Amegakure, but also extended his control to the Land of Rain as a whole, eventually proclaiming himself as the Daimyo of the Land of Rain in addition to being the Kage of Otogakure. After this conquest, Hayate's domain extended from the Land of Rain, through Northern Shumatsu province in the Land of Fire, and through to Otogakure and the Land of Rice Paddies. This created large amounts of tension, especially with the Daimyo of the Land of Rice Paddies, who nominally viewed himself as the lord of the lands in which Otogakure resided. Still, Hayate's strength cowed the opposing daimyo, and there were many rumors that Hayate had used Kotoamatsukami on his rival. Under Hayate's rule, much of Amegakure's resources and infrastructure was diverted to Otogakure. Through a decade of labor, Otogakure was quickly transformed and modeled in Amekage's style, which Hayate greatly admired. He greatly admired Amegakure's technology, infrastructure, and systems, because he saw them as more advanced than those of other nations, as intense warfare breeds innovation. In a sense, the conquering force of Otogakure was, effectively, conquered by the culture of Amegakure. Under Hayate's harsh but fair rule, dissent from Amegakure was virtually non-existent. Aside from one rebellion in 801 A.S., in an attempt to restore independence, Amegakure grew increasingly content with the rule of their daimyo, who had proven his military success not only in his conquest of the village, but in the seizing of Northern Shumatsu from the Land of Fire. This sense of content was only furthered when Hayate began reconstructing Otogakure in Amegakure's fashion, and many Amegakure denizens migrated to the new megalopolis. Eventually, Hayate was punished for his transgressions. A group of Amegakure insurrectionists, rumored to have been backed by several foreign daimyo and villages, assassinated the Uchiha clan head in 807, at the height of his power. He had brought Otogakure from a position of weakness to a position of strength, be seizing a strategically important nation in the Land of Rain, and securing it with a passage through the Land of Fire. Many were concerned his death would result in the independence of Amegakure, just as Kumogakure had secured independence in 784. However, Hayate was succeeded as Daimyo of the Land of Rain by his son, Lord Saizo Uchiha. Saizo had been raised by his father to admire the Land of Rain and Amegakure, and continued the importation of Amegakure goods into Otogakure. His retribution was swift, and he hunted down and killed several of the insurrectionists involved in his father's killing. His swift response in avenging a murdered Otokage, in addition to possessing the skills to bring such justice, resulted in Saizo being appointed Otokage, filling the position left vacant by his father. Many whisper now that this is the beginning of a long line of an Uchiha Dynasty that will rule over the two nations, despite the lack of any documentation uniting the position of Otokage (an elected or appointed position) with the position of Daimyo of the Land of Rain (a hereditary position). In order to promote unity between both Sound and Rain, and likely highlighting his own power in the process, Saizo renamed the Sound Village, which had become something fundamentally new in the previous decade. He chose the name Kemurigakure, meaning the Village Hidden in the Smoke, a moniker that comes from all the plumes of smoke that would loom over the village during its intense and rapid construction. In the present day, Kemurigakure thrives. It is a bustling village of high-rise buildings, held aloft by metal pipes and supports, not unlike in Amegakure. The entire village is centered around the massive World Tree, re-appropriated over one-hundred years ago from Takigakure. In recent years, the World Tree has had many of its branches and limbs chopped off, using its chakra-enhanced wood to fuel the rapid transformation of the Hidden Smoke Village. Kemurigakure even features the nearly constant rain that was a prominent phenomenon of Amegakure. Their symbol is a circle with four vertical lines running through it, though many Kemurigakure shinobi use their old Amegakure or Otogakure headbands. With the Kemurikage, Saizo, assassinated at the hands of Darkeater, his wife and sister-in-law, the twins Tane and Rumi have risen to power. However, Konohagakure and Sunagakure, sensing weakness, have leaped on the opportunity to assault Kemuri. A battle currently rages at the gates of the Hidden Smoke! You are almost never more than a few miles away from a monastery run by this class of folk. The philosophies they follow are far more varied than their samurai brethren – from Zen to Pure Land, to traditional Vajrayana Buddhism one can find a great wealth of differences. Some are more religious in nature, with others having a primarily spiritual component. There are few similarities between them all – but being one with yourself, and the world around you, is a central tenet in almost all Buddhism. Buddhists Monks can be accepted into the monastery at any age. They are expected to take on an ascetic life filled with busy work, mastery of the Buddhist arts, and meditation. Mastery over one’s body is believed to be just as important as mastery as one’s mind and – in truth, for Buddhist philosophies, one cannot be gained without the other. The busy work serves as a two-fold purpose, as a form of secondary meditation and a way to remind the Monk about the humility and suffering of existence. Many monks choose to, for one reason or another, join the shinobi forces for their local villages. Whether this be as a tributary from their monastery in lieu of tax, or a personal decision, the reasons will vary from person to person. Often they bring a wisdom and perspective that’s more real-world than the real-politik of the shinobi world, though a Monk needs to be wary to not fall prey to such thoughts. Buddhists use a special type of chakra. This is generally called Gift of the Hermit Group chakra, though different monasteries might have different names for it. It is honed through vigorous meditation and training. This chakra is weighted towards spiritual energy, but does not undergo any nature or shape transformation. This prevents shinobi from using Buddhist techniques without the fighting style. Similarly, Buddhists are unfamiliar with nature and shape transformation, preventing them from using ninjutsu without the fighting style. The Samurai have long been auxiliary to the Shinobi peoples, though they are not entirely different. Where a shinobi follows a personal nindo, samurai instead follow bushidō. This code, while not solidly defined by any samurai philosopher, refers generally to a set of ideas governing military conduct and honorable behavior. These are typically codified in eight tenets – though there are, of course, other philosophical interpretations. The traditional eight tenets have to do with courage, honor, honesty, righteousness, compassion, duty/loyalty, and self control. Depending on Bushido Scholar that one adheres to, various aspects may be exonerated above all other. In more extreme cases, only one or two tenets are considered true Bushido at all, and these need not necessarily be any of the aforementioned eight tenets. Such extreme schools may place emphasis on victory at all costs, or ruthlessness. But all samurai will follow some code of bushidō. A defining characteristic of a samurai is their daishō. This means "big-little" literally, and refers to a katana with a smaller blade, be it a wakizashi or tantō. They are an important part of the Samurai’s image and in the now defunct Land of Iron it was the daishō that marked one as being part of the samurai class. They place great emphasis on all martial arts, but the two Skills they focus on, above all else, are Kyūjutsu and Kenjutsu. All samurai, from an early age, are trained in the rudimentary basics of both of these skills, whether or not they choose to pursue them to their highest levels. Nearly a century ago their ancestral homeland was rendered mostly uninhabitable. After such a time, it has mostly been restored to a livable state, and there have been minor attempts to re-colonize it. Despite this, Samurai are primarily found spread among the various shinobi villages across the continent. Many Kage view them as incredibly trustworthy warriors, and a godsend in a world where subterfuge and underhanded dealings reign supreme. They have some difficulty in competing with some of the strongest shinobi, but clever warriors have historically always bridge the gap.